Imagine a radiant black woman pictured larger than life, her eyes, lips, and afro exquisitely detailed in rhinestones so that she sparkles and shines. She is a vision of luminosity that draws you in, set upon a pastiche of vintage patterns that evoke the spirit of the 1970s. She is the Foxy Brown and Beverly Johnson residing within black women everywhere. 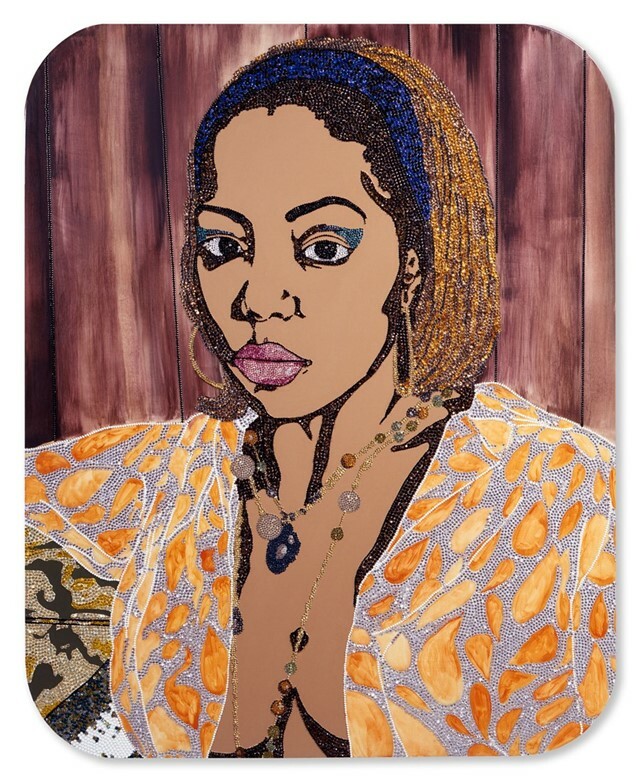 She is the vision of African-American artist Mickalene Thomas, whose magnificent portraits have been taking the art world by storm for the past two decades. Drawing from a wealth of art historical and pop culture sources, Thomas creates mesmerising paintings, collages, photographs, videos, or installations that stand as a testament to female beauty, sexuality, and power. Thomas’ layered portraits, interiors, and landscape works explore the relationship between representation, identity, and gender, providing a dynamic space for reflection, contemplation, and celebration of the female form – one that is infinitely attuned to the ways in which a work of art can become both a public and private space for communion. 2018 has begun with a rousing start, with Thomas joining Robert Colescott and Kerry James Marshall for Figuring History, now on view at the Seattle Art Museum. The exhibition, which brings together three generations of contemporary American artists, speaks to the canon of western art, which has long ignored or marginalised the contributions of people of colour. Here, Thomas, Colescott, and Marshall reclaim this vital space, offering exciting perspectives on black culture and history. On April 7, Thomas will present “Do I Look Like a Lady”, a 12-minute, two-channel video collage of iconic figures like Josephine Baker, Jackie “Moms” Mabley, and Whitney Houston as part of You Are Here: Light, Color, and Sound Experiences at the North Caroline Museum of Art in Raleigh. The exhibition will also include four silkscreen works of pioneer African-American women including Naomi Sims, the first black supermodel, and Diahann Carroll, one of the first black actresses to break the colour barrier in Hollywood. 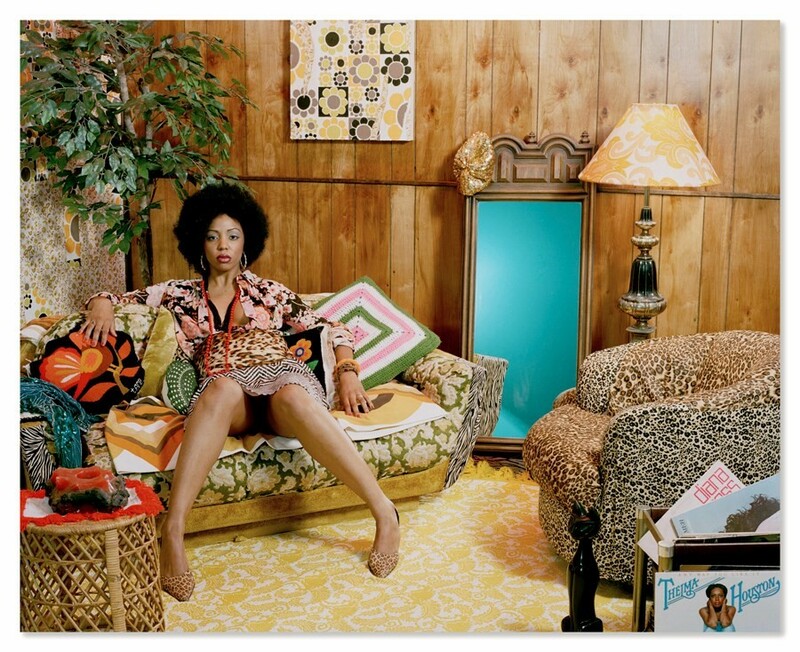 If you can’t travel to the shows, the work can just as easily come to you in the stunning illustrated book Muse: Mickalene Thomas Photographs (Aperture, 2015). The book takes you on a guided tour through Thomas’ world, one that draws inspiration from sources as diverse as 70s actress Vonetta McGee, French painter Édouard Manet, Harlem Renaissance photographer James Van Der Zee, and Malian studio photographer Malick Sidibé. Muse also includes a conversation between Thomas and Carrie Mae Weems, whose 1994 exhibition at the Portland Art Museum was a turning point for Thomas as a young artist. Here, Thomas shares the people and experiences that informed her work, providing insight into her process and perspective that has made her one of the most influential artists of our time. Growing up in Camden, New Jersey, during the 1970s, Thomas was first exposed to art through after-school programmes at the Newark Museum and the Henry Street Settlement in New York. Her work channels a host of references, from the vibrant patterns and colour palettes of the era to the sensual female forms of Blaxploitation films to create a kaleidoscopic series of portraiture. The joy of each work by Thomas is the ways in which it brings together all of these formative experiences and transcends the limits of time and space, reminding us that the whole is greater than the sum of its parts. Her work serves as a bridge between the past, present, and future, drawing us through time so that we may recognise a piece of ourselves in the work, even if it does not necessarily reflect our biographical experiences. In the mid-80s, Thomas moved to Portland to attend school, where she studied pre-law and Theater Arts. In 1994, she saw an early exhibition of the work of Carrie Mae Weems at the Portland Art Museum, which became a turning point in Thomas’ life. Inspired by the Weems’ photographs, Thomas decided to apply to the Pratt Institute in Brooklyn and use her experiences, impressions, and sensibilities as the basis for her work. While attending the Yale School of Art, Thomas enrolled in a photography course with David Hilliard, who instructed her to explore the medium by taking pictures of her mother. This experience grounded Thomas in a practice that she has used ever since, providing a means of entrée into the work by looking at herself, her friends, and loved ones through the camera. The work may begin with the photograph, but it does not stop there as Thomas adds layers of materials to the picture plane. Rhinestones, sequins, glitter, oil, acrylic, enamel, silkscreen, varnish, and paper collaged out of magazines and pattern books come together in a dazzling panoply of materials that is as captivating as the subject itself. The subject of the gaze in art is nuanced and rich, ripe with layers to be peeled away until we reach the core of humanity. 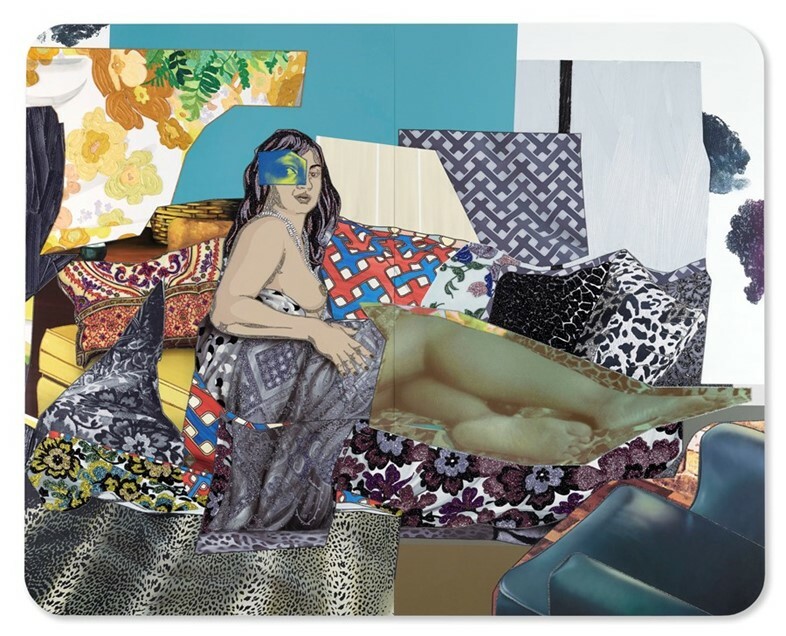 Where some artists wholly embrace or resist the idea of a “female gaze,” Thomas takes on the inherent complexity, conflicts, and contradictions of a complementary approach. Thomas’ work brings to bear the power of representation to change not only the way we see ourselves but our understanding of the world in which we live. The traditions of western art have largely excluded those who were neither white nor male, but in recent decades, a shift has occurred, creating an inclusive space for people from all walks of life. When Thomas began taking photographs in the early 2000s, the mainstream media was working with reductive stereotypes of young black women in the form of Mary J. Blige, Lil’ Kim, and Foxy Brown, who limited themselves to appearing as objects of desire. “It appeared to me that as a black woman, I was subject to the same kind of limitations and framework in which they performed. And I found this presentation of black women to be deeply in conflict with my understanding of myself and most black women I knew,” Thomas explains. By casting friends and family members in her work, Thomas has taken control of the narrative. By creating empowering images filled with agency, awareness, and self-love, Thomas’ work evokes profound feelings of joy and communion with her subjects. You Are Here: Light, Color, and Sound Experiences is on view at the North Caroline Museum of Art, Raleigh, through July 22, 2018.